Jane Toal in her Mariner uniform. Our Archives and History Committee lost one of its original members last month, Jane Toal. I never met Jane, she had gone into assisted living around the time I joined the Committee, but I heard her name often from other members. Now that I’ve had a chance to read her obituary and read some of the tributes to her, I especially regret never making her acquaintance. Her life story is a testament to Girl Scouts and STEM programs. Jane Nicolet was born in 1921 and grew up in Riverdale, Maryland, outside Washington. 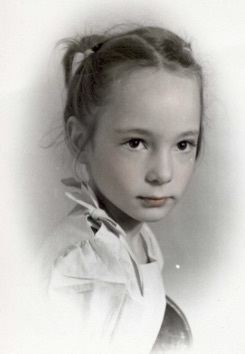 She joined a Girl Scout troop in 1931, at age 9½. She seems to have seized every opportunity that came her way: she was in the first local Senior troop, led by Lucy Knox. The troop helped prepare Rockwood National Center to receive its first campers in 1937. Lucy and other girls spent many weekends reupholstering furniture at Rockwood and sleeping on the floor of Carolyn Cottage. Jane also was involved in the activities of the Little House, including once serving a meal to Eleanor Roosevelt. She quickly became a regular figure at Camp May Flather, living in each of the various units and co-editing the camp newspaper, the Mountain Log. Washington Post, June 11, 1939. Jane was awarded the prestigious Golden Eaglet on June 10, 1939. She left the Washington area for college, first to Oberlin College and then to Cornell University, where she earned a master’s degree in biochemistry. Upon graduation, she took a job at Rutgers University. After a brief marriage, she led an Intermediate troop in New Jersey. Jane returned to Washington in 1947 to accept a research position at the National Institutes of Health. She spent the next 30 years conducting structural studies of DNA and RNA. She bought a boat in 1950 and taught herself to sail. When she heard about a Mariner Girl Scout troop forming in the area she signed on. She stayed with the Mariner program for 27 years, taking full advantage of the nearby Chesapeake Bay. She proudly wore her Mariner uniform for official events and led a Bethesda-based troop from 1964 to 1977. Over the years, Jane kept sailing, but she did add to her outside interests. She rode with the Iron Bridge Hunt and the Howard County Hunt until her 90th birthday and was an active member of the Trail Riders of Today. She was also part of the devoted crew that maintains the historic carousel at Glen Echo park. For decades, she rallied troops that turned out to polish the brass on the carousel before it opens for the season. Jane Toal’s homemade Mariner doll. It is a shame that a woman once so involved in our Council’s History programs never was able to visit our now two-year old Program Center in Frederick, Maryland. But we do have a homemade doll that she donated years ago. With bright red hair, it even looks a bit like her. The doll is prominently displayed at the Center, a small way to keep Jane involved in Girl Scout history. Special thank you to Julie Lineberry, whose previous profile of Jane was essential for this post. 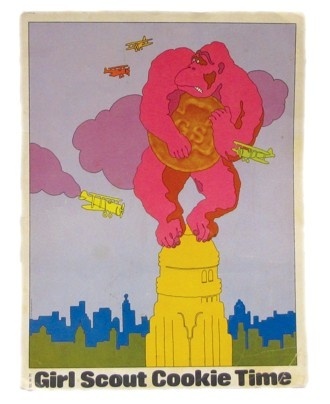 She’s the fresh-faced young lady in a khaki pork-pie hat beaming in a vintage Girl Scout poster. Her friendly face is also captured on a vintage pin-back button. But who is this famous Girl Scout? Sadly, this model Girl Scout has no name. She is the creation of popular artist and illustrator Lester Ralph (1877-1927). Lester Ralph specialized in paintings of women and their pets. 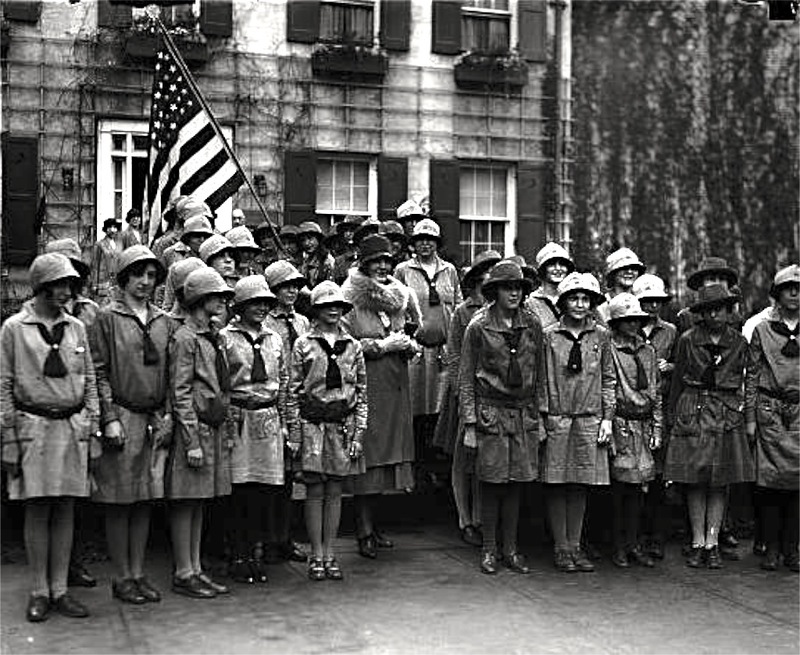 The watercolor painting was first used on a poster for Girl Scout week in 1919. It was used for a variety of publicity purposes, but she is best known as the face of the 1924 “Buy a Brick” campaign. In any case, by 1924 the organization was trying to raise $500,000 for a new building at 670 Lexington Avenue. The national fund drive was chaired by popular mystery writer Mary Roberts Rinehart, who came up with the notion to sell “parts” of the new building. One brick cost $10, walls were slightly higher. Donors received the small button as an acknowledgement of their generosity. 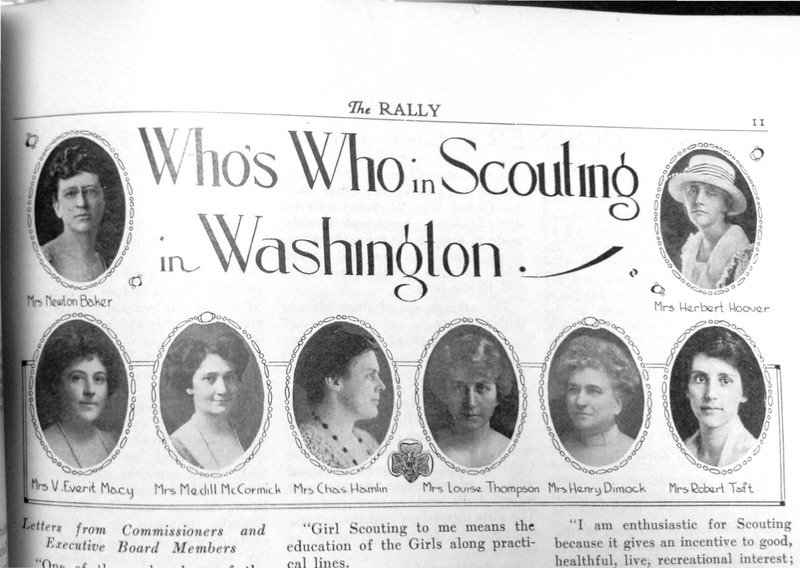 The building campaign overlapped with the Girl Scouts’ acquisition of the model Little House in Washington, DC, causing considerable confusion on several fronts. 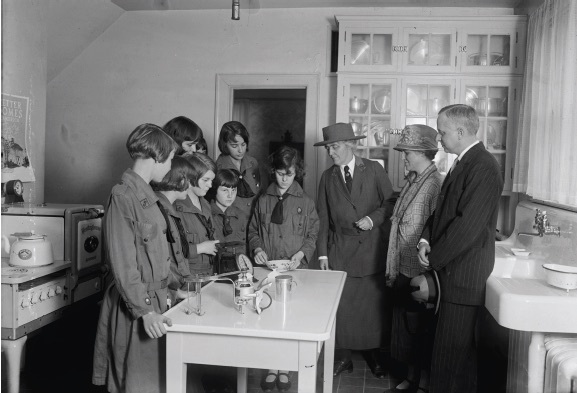 Unaware that the Girl Scouts had already approached the Rockefeller Foundation for a donation toward the new headquarters, the regular operating budget, and American Girl magazine, Lida Hafford, director of the General Federation of Women’s Clubs, contacted the very same foundation about funding a permanent home for the Little House. Even the Girl Scouts national board of directors became befuddled over the matter, with some thinking the national headquarters was returning to Washington, DC, specifically to the Little House. National President Lou Henry Hoover eventually came to the rescue. With a flurry of telegrams she clarified who was moving where, and she even put up her own money to physically tow the Little House to a permanent site just west of the White House. Throughout the administrative ordeal, our yellow brick Girl Scout never lost her confident smile, never slumped her shoulders in despair. 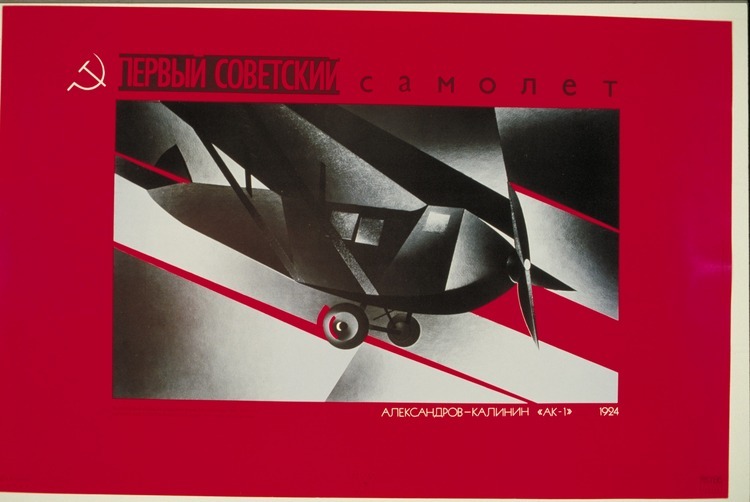 Her image was repurposed for additional posters before being retired in 1928, following the death of the artist. Dorothy, the yellow brick Girl Scout. If we could just make ruby slippers part of the Girl Scout shoe collection…..
Today, instead of Throw Back Thursday (#TBT), let’s have Throw Out Thursday. I’ve written before about the Girl Scout Little House in Washington, DC. 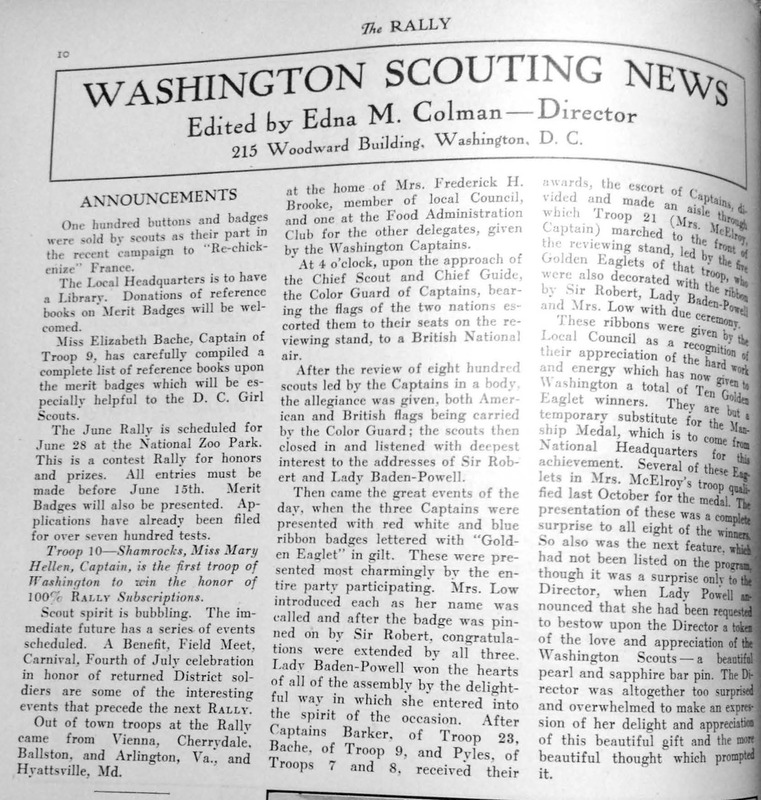 Located at 1750 New York Avenue NW, about two blocks from the White House, it was a model home where Girl Scouts learned the basics of housekeeping, hospitality, and child care. Built for the second Better Homes Demonstration Week in June 1923, the Better Homes in America and General Federation of Women’s Clubs donated it to the Girl Scouts, and National Girl Scout President Lou Henry Hoover quietly paid $12,000 to move it from the National Mall to its new location. 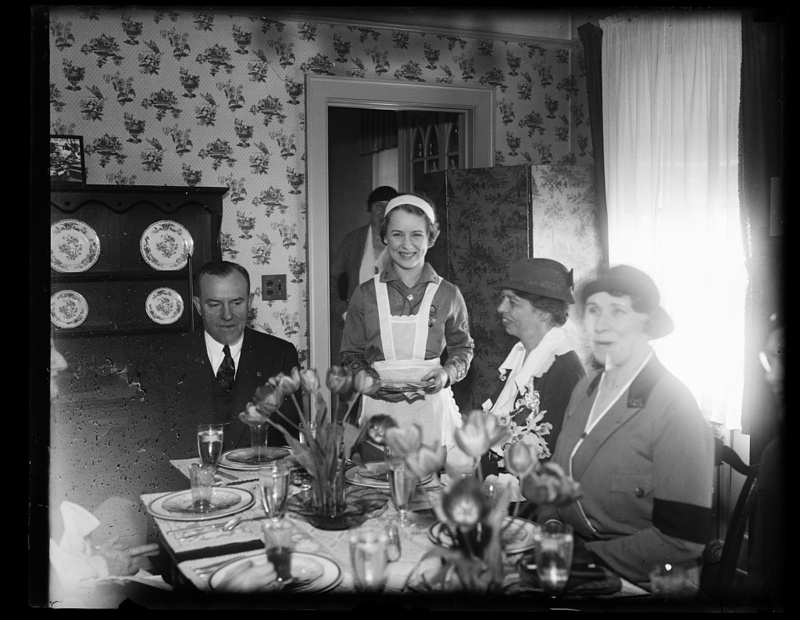 To encourage other councils to create similar opportunities for their troops, in 1930 Mrs. Hoover, now first lady, commissioned a highly detailed doll-sized version of the Little House. Everything matched the actual house, down to the wallpaper patterns. The dolls inside even wore tiny Girl Scout uniforms. 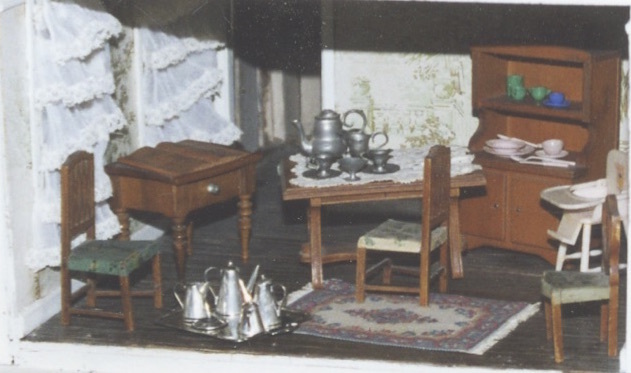 She arranged for the doll house to be displayed at the 1930 national convention in Indianapolis. 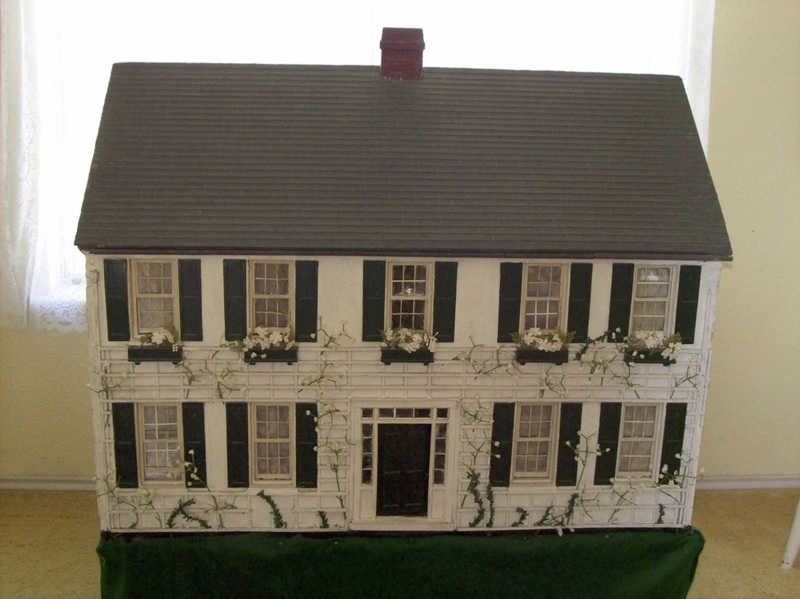 Afterward, the doll house toured the country, before taking up residence at the original house in Washington. Photo from Dorothy Angel Tenney. The Little House was used continuously for trainings and demonstrations of the domestic arts from June 1923 to April 1945. The Girl Scouts soon outgrew the building and vacated it in May 1955. The house itself was torn down in the early 1970s. 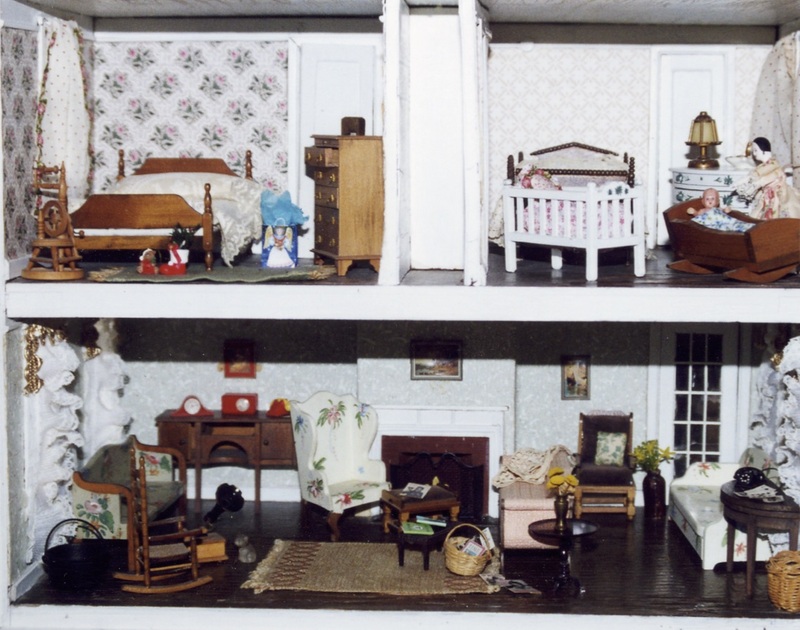 The doll house was taken to Rockwood, the Girl Scout national camp outside Washington, DC. But the manager there saw no need for a doll house at a camp, so it wound up on the trash pile. I knew that a Rockwood housekeeper, Maude Hill, retrieved the doll house and gave it to a family that she worked for part time. The family had a little girl who was just the right age for the toy. She played with it and eventually donated it to the Hoover Presidential Library in 2012, the year of the Girl Scout centennial. 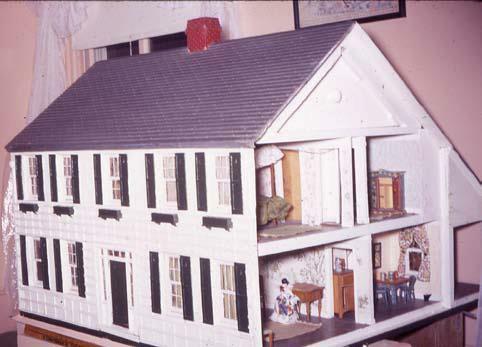 Imagine my surprise a few months ago, when that “little girl” contacted me, offering photos of the doll house! 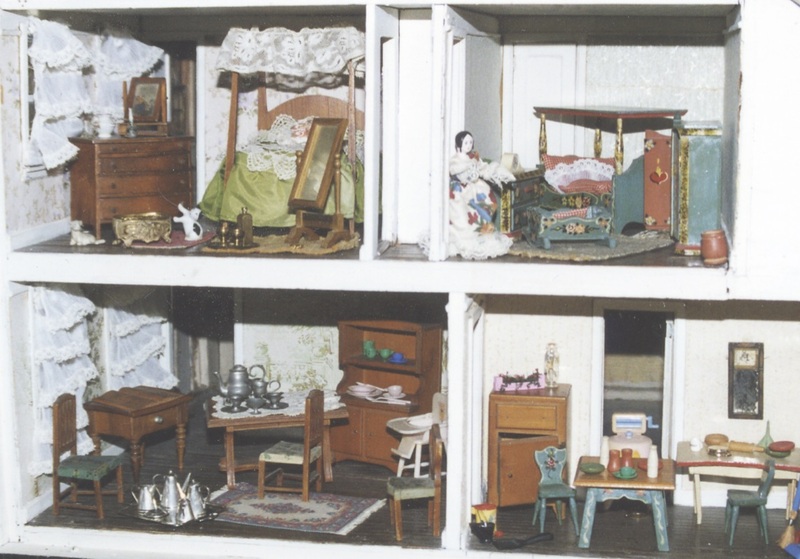 On May 26, 1950, Mrs. Hill told Mrs. Angel that a wonderful doll house had been just tossed out for junk and that Mrs. Angel’s young daughter would love it. Mrs. Angel said she did not want some ratty little doll house that no one else wanted. Mrs. Hill persisted during the next several days and eventually prevailed upon Mrs. Angel to look at it. Mrs. Angel immediately had a laborer load the doll house in her car trunk and took it home. For Dorothy, it was a wonderful toy. She played with it carefully and didn’t break a single piece of furniture. However, many of the original pieces, including the dolls, had been lost by the time Mrs. Hill discovered it. Fortunately for Girl Scout history buffs, Dorothy’s father wasn’t just an ordinary father. He was an archivist! In fact, Herbert Angel, was Deputy Archivist of the United States from 1968 to his retirement in 1972. He researched the provenance of the doll house, and the family kept the treasure long after Dorothy outgrew dolls. Dorothy shared these photos of the doll house. Isn’t it a delight?